What’s special about Antoinette Tuff is that the actions she took are nothing you or I couldn't do as well. When someone does something dazzling — like talking down a would-be mass murderer who enters a school to start shooting — it’s easy to feel like we couldn’t do that ourselves. But what’s special about Antoinette Tuff, the elementary school secretary who did just this in Georgia last week, is that the actions she took are nothing you or I couldn’t do as well. The steps she took are consistent with many other stories I’ve encountered of effective nonviolent resistance against a violent threat. In a video interview, Tuff acknowledged that she was “terrified.” A man came into the school office with heavy automatic weapons and ammunition on display, and he said that he expected to die that day. Tuff, a young mother, struck up a conversation. She didn’t give up trying to stop him even as she heard police arriving for a shoot-out that might leave a number of children and school personnel dead. By the end of their conversation, the shooter surrendered himself. As they talked, she refused to accept the shooter’s script for how the day would go, explicitly contradicting it multiple times: “You don’t need to die,” she reminded him. She didn’t pretend to hide her fear and reach for bravado. Instead, she related to what in the shooter was, in his own broken way, authentic. She listened. She learned that he hadn’t taken his medication. She asked further questions and each time waited for him to answer, sometimes repeating his answers back to let him know she was listening. She anchored herself as she sat in her chair behind the desk, remembering that she had a relationship with a higher power. As she listened, she accessed from inside herself various points of identification. He said his last name was Hill, which she said was her mom’s maiden name. She told the shooter about her disabled son. Her own life has been hard. She told him little stories about herself, hoping that something in them would connect with his own life, and sometimes they did. She reassured him. She said that he could drink the water he’d brought with him, that she would stay right there with him, that she would sit in plain sight so the police could see that she was okay and not harmed. She waited until he began to trust her before she gave instructions. Then she told him to put his weapons on the table and, after that, to lie on the floor behind the office counter, putting a kind of shield between him and the police. And then what almost certainly would have been a horrible tragedy was over. In no way do I mean to diminish how remarkable her intervention was. She was a hero, no doubt. But we don’t need to let that fact make her actions seem more extraordinary than they were. I believe our job is not to let heroes make us feel smaller, but instead to learn from them and grow so that on a good day we, also, can pull off a saving grace. By choosing to be courageous (and I believe it is a choice), Antoinette Tuff expanded her perception and was able to notice many things that she could make work for her, aspects about him and also about her own situation. That’s pro-survival. When we’re up against a violent threat, however, it’s easy to imagine that those using violence are simple-minded and have only one goal. That kind of narrowing is anti-survival. People who succeed in diffusing potentially violent situations often do so with some way of broadening their initial perception of the conflict. We can pay attention to the group dynamics of the attackers and use what we learn to undermine their self-confidence. We can build social ties with the people around us to ensure it’s clear that we’re looking out for one another. We can step back from provocations and respond with calm and dignity. The would-be mass murderer whom Antoinette Tuff encountered at the office that morning would get high ratings from anyone for single-mindedness. But rather than focusing on that, she chose to widen her perception and discover a side of him other than how he initially presented himself. I’m so glad to see you cover this story. I only found out about it on Monday, and I find it incredibly inspiring. While I think there’s much to analyze about tragedies such as the school shooting earlier this year, I think there’s at least as much, if not more to be learned from tragedies which are averted. Interesting point you raise about courage being a choice, and I think I agree. I also think courage sometimes comes as a powerful compulsion, but ultimately, one has to choose to put that compulsion into action. 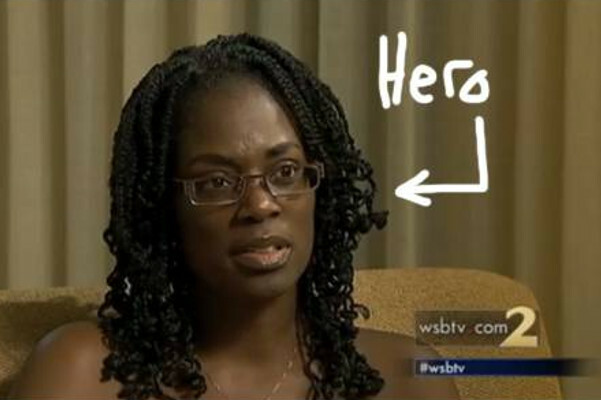 I believe Antionette Tuff’s actions last Tuesday were both heroic and extraordinary. Extraordinary, in the sense of being well outside the range of heroism an ordinary human being is apt to be called to in a given decade, maybe even lifetime – but not in the sense of being outside the range of heroism an ordinary human being is capable of when necessary. One of the goals for nonviolence, it seems to me, should be to help more people to become conscious of and better able to tap into their own inner heroism. I think Tuff’s case is a beautiful object lesson in how this can be done. God, I miss the pre-SWAT days when real policemen would actually negotiate with barricaded, frightened/angry, armed individuals. The officer would talk level-headedly, clear, audibly, remove his shirt–even his T-shirt–talk, torso exposed, vulnerably/trustingly walk into the building and talk with the suspect till they eventually walked out together, almost as brothers in arms. A relieved officer and a disarmed, remorseful, embarrassed, but very live suspect. Ms Tuff does justice to her name–a tough, authentic heroine for a more civilized age.